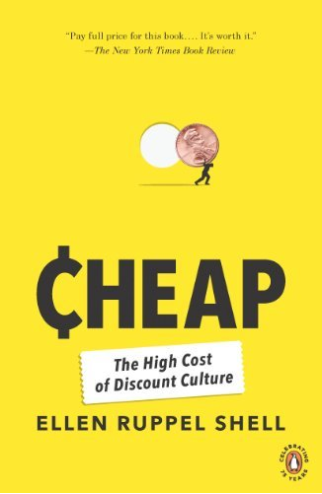 A very engaging journey through the history of cheap, from shops to malls to outlets to sales to IKEA to shrimps to globalization. Ignore the brief denunciations of capitalism and globalization and this is a five-star book. Thankfully much of the globalization phillipic is isolated at the beginning and end. This book argues that cheap is different from a bargain. Cheap implies lack of longevity, lack of craftsmanship, and hidden costs that are sometimes not apparent till several years or decades after the purchase. Globalization is an imperative and inevitable but its costs are heavy. The book covers territory that is expected - the beginnings of the discount retail culture, but which requires a journey into the years following American independence to understand the underpinnings of cheap - standardization and industrialization. The insidious strategy behind outlet malls is an eye-opener. The psychology of sales, rebates, and coupons is also discussed by looking at how the mind works and responds to sales (answer: when confronted with sales we don't think much, and the little thinking that we do do is muddled and confused). When you talk about cheap you have to talk about superstores, food, IKEA, and China. India too gets a mention, but it is China that is today the manufacturing outsourcer to the world. The book does not cover "cheap" in the context of software, else India would have received its share of, err, attention. The industrialization of food has been covered in the definitive classic of our times, "Fast Food Nation", but there is new and relevant information to be found here - shrimp farming in Thailand and the havoc it has wreaked on the economies and the environment in those countries for one. The author also argues that it is the expansion of the global and interconnected labor force that has actually done the American worker more harm than good. By flattening the world, and making outsourcing feasible and economical, the American worker has been shorn of bargaining power. So what about my crib with the author's anti-globalization rant? Well, in the chapters (mostly the first and last) where the author opines and philosophizes, the narrative is hyper-critical of capitalism and globalization. To paraphrase the author, globalization is inevitable, but free trade has not been all that great. Worker wages in India and China are instrumental in enabling the exploitation of workers in the United States. Low wages may be better than nothing at all for those workers but it is an insidiously cheap bargain that we agree to. Thomas Friedman gets it wrong in The World Is Flat, the conservative economist and Harvard professor Greg Mankiw is wrong, Adam Smith is wrong because lived in a world that was different and his observations don't really hold true in today's hyper-globalized world, Schumpeter's Creative Destruction is more about destruction than creation today, and so on... You get the picture. The litany of criticisms however stops just as it about to tires. The author's points are well-taken, but the solutions are not that apparent, or practical. Better enforcement of regulations and laws in developing countries, perhaps. Outsourcing also meant that goods had to be mass-produced ahead of time. This meant that "consumers, although treated to what seemed like an ever-expanding variety of merchandise, were in fact being offered less variety and more variations on a theme." The price-tag, now considered as integral a part of any item sold in any store as the good being sold itself, was the invention of Philadelphia haberdasher John Wanamaker, who is also credited with the first January White sale. Then there is the bar code - the Uniform Product Code (UPC), that became ubiquitous once "Kmart adopted bar codes in the early 1980s ... pressuring suppliers to tag all their products with the little black bars before delivering them to stores or warehouses." Bar codes basically made it possible to record and analyze customer preferences in real-time, or near real-time. Chapter Four, "The Outlet Gambit" was an eye-opener. At least for me. Outlets are where the smart shopper goes to get a great bargain on premium goods. Bargain prices for luxury goods. And outlet malls are typically located 50 miles or sohi from towns, where "shadows, where real estate is cheap and the tax incentives sweet." Or so goes the marketing. Ok, so let's pop the bubble. First, the location of outlets is very, very strategic, and the location meant to convey bargains. "In the public mind, convenience is a trade-off for price, and price is traded off for convenience. Inconvenience connotes cheap, while convenience connotes pricey." Second, in addition to premium outlets you have discounters at outlet malls, like "Crescent succeed by offering the perception of value using two signals: one, being situated in an outlet mall associated with so-called premium brands, and two, setting very high reference prices". Third, luxury brands sometimes derive most of their revenues from outlet stores! Coach for example, a $2 billion company, is said to earn most of its profits from its factory outlet stores. So, while some brands sell slightly imperfect or damaged goods at steeply discounted prices at outlets - at least that was the original thinking behind outlets: to sell slightly defective or out-of-fashion goods at factory outlet stores so as to not dilute the brand of the store's marquee stores, some other brands "add to their mix items made explicitly for the outlets. Generally these items are cheaper to produce, have fewer details, and are of lesser quality. Still, they carry the brand name, and therefore seem to be worth if not the reference price, then certainly more than the asking price. Lichtenstein put it this way: “Outlet malls today are the absolute epitome of the reference pricing scam.”"
Chapter Five, "Markdown Madness" looks at the madness of radical price cuts. Once you have a sale, you can't stop. You can't stop shopping at sales, and retailers cannot stop offering sales. Symbiotic relationship. Or a desperate slide to the bottom, that feeds upon itself, ad infinitum. "In 1955 the dollar value of total markdowns as a percentage of department store sales was a paltry 5.2 percent. ... in 2001 the dollar percentage of marked-down goods across all sectors—toys, electronics, clothing—had grown to an astonishing 33 percent." One way to have a sale is to have a sale but not offer discounts. You do that by offering rebates. Not instant rebates, but the kind that need to be filled out and mailed. The best rebate is the one that is never redeemed. "But, as a rule, rebate redemption rates are very low, hovering in the 5 to 10 percent range for many items. ... Promotions that generate redemption rates greater than 35 percent are considered marginal by manufacturers and retailers; and a 50 percent redemption rate is considered an abject failure." The chapter also looks at the madness, or the psychology of the human mind, that drives us to make purchases of things we probably do not need. "When setting discounts, marketers aim to activate the primary process in the brain, the emotional, impulsive side. In technical terms, their goal is to “spike the affective response to block the cognitive assessment.” In layperson’s terms, their goal is to distract customers from thinking hard about a purchase or, for that matter, thinking hard about anything at all." Damasio argued that both logic and emotion are required for decision making, and that systems that control these functions, while separate, communicate with one another to jointly affect our behavior. That said, the emotional system—the older of the two in evolutionary terms—typically exerts the first and more powerful force on our thinking and behavior. If we sense we are getting the short end of the stick, we balk, even if not grabbing the short end makes us tumble back into the lake. The inexorable drive towards cheap food and fast-food has driven down prices of food to ridiculously low levels. However, as Michael Pollan points out, it is not really food but food-like edible substances that we eat nowadays. The cheap food we eat today also means that "scientists writing in the New England Journal of Medicine linked cheap food to a startling prediction: that the next generation of Americans will be the first in human history to die younger than their parents." And this is not just because the byproduct of fast-food, mostly meat, is excrement. "Two feedlots outside Greeley, Colorado, together produce more excrement than the cities of Atlanta, Boston, Denver, and St. Louis combined. combined. Trucking the stuff off is impractical. One alternative popular among big companies is to spray liquefied manure into the air and let it fall where it may, coating trees and anything else that happens to be in its path." As for the animals that are bred to be slaughtered at these feedlots, the less said the better. For them as well as for the people who consume that meat. "Factory pigs are bred to be lean, so lean that producers sometimes inject their flesh with saline marinades to make it palatable. Stressful lives tend to make factory-grown pork acidic, bleaching it pale and breaking the tissue down to something flaccid, watery, and limp..."
This book is an inexpensive, not cheap, way to get familiarized with the complex world of cheap. Excellent book.